The one-arm push-up might be one of the most difficult bodyweight movements to master. Almost 70 percent of your bodyweight is bearing down on one arm. If you can accomplish this fitness feat it's a great trick for parties or to impress everyone at the gym. In addition to giving you a slight ego boost, the exercise works wonders for your body as it strengthens your arm, shoulder, chest, core and even your hips. To perform a one-arm push-up, you need to start in a different position than a regular push-up. Your feet should be relatively wide, almost a foot wider than shoulder-width apart. Whichever arm you decide to start with, put that hand directly under the center of your chest. Point your hand towards the opposite shoulder, which will rotate your arm in. If you rotate the arm out it will put undue stress on your elbow,. As you descend into the push-up, keep your core tight and rotate your shoulders slightly towards the arm that is pressing. Drop as low as you can and then press back up. When you're performing one-arm push-ups, there are a few mistakes that you should try to avoid. The International Sport Sciences Association advises that you don't drop your head down below your shoulders, let your lower back sag down towards the ground or raise your hips too high during the push-up. Try to keep your spine in a straight line to avoid placing undue stress on any part. The most obvious benefits of the one-arm push-up are similar to the regular push-up: stronger arms, chest and shoulders. These are the main muscles involved in pressing exercises. Specifically, the pectoralis major (chest), anterior deltoids (fronts of the shoulders), and triceps (arm) muscles. Together these muscles need to be strong enough to not only support but press a large percentage of your body weight. In a regular push-up you will support about 74 percent of your body weight for men and 70 percent for women with your upper body muscles, according to a study conducted at Barry University in 2014. The next group of muscles that get a good workout during the one-armed push-up are in your torso or "core." Your obliques, which are the ab muscles located to the sides of your torso, are constantly working during the one-arm push-up. These muscles cause you to rotate in an activity like throwing a baseball but they also work to prevent you from rotating. 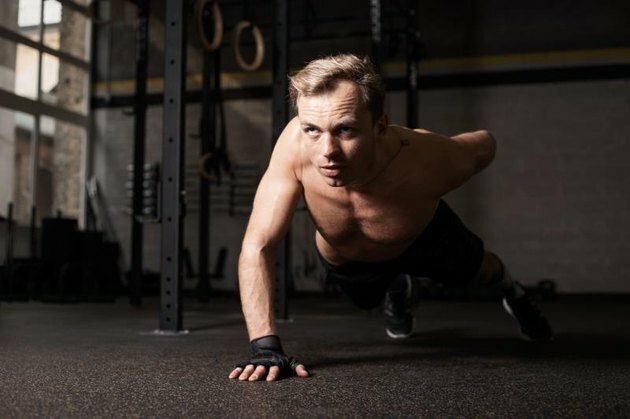 In the one-arm push-up you have to fight the tendency to rotate towards your pressing arm and collapse down because the other side of your body is not supported. The only thing keeping your non-pressing shoulder up are the muscles in your core. Strengthening these muscles through one-arm push-ups carries over into other activities. Rotational activities like tennis and golf will be much easier. Your spine will also be a little safer; strengthening your core muscles helps prevent back injuries. The one-arm push-up even helps you strengthen your hips. You are constantly fighting rotation in the one-arm push-up which requires a lot of hip strength. Due to the twisting motion of your upper body, most of the weight will be on the leg that is opposite of the arm doing the pressing. A large portion of your body weight has to be held up by your hip flexors on that side. 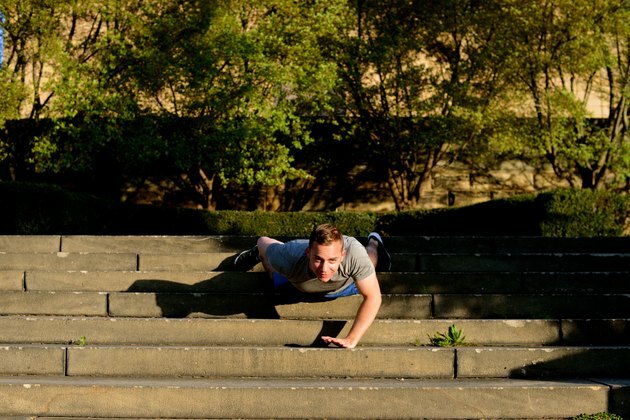 Read More: What Is the Hardest Push-Up? A one-arm push-up is considered a unilateral exercise because you are only working one side. One of the benefits of unilateral exercise is that you can work each side of your body independently. Most people have a dominant side, especially in the upper body, and it is hard to train each side evenly when one always takes over. The one-arm push-up gives you a chance to strengthen each arm individually and even up their strength differences. The one-arm push-up is a challenging exercise but, if you're up to the challenge, is loaded with benefits. From your arms down to your hips, the one-arm push-up will make you stronger and give you more control over your spine and the rest of your body.